"Gratitude is of the very essence of worship—thanksgiving to the God of Heaven, who has given us all that we have that is good. "As you know, I served as a counselor to President Ezra Taft Benson, and I was with him many times when he prayed. He did not ask for very much in his prayers. His prayers were expressions of gratitude. Be thankful. When you walk with gratitude, you do not walk with arrogance and conceit and egotism, you walk with a spirit of thanksgiving that is becoming to you and will bless your lives. Be grateful. Be thankful to the Almighty for His wonderful blessings upon you. You have all that this great age has to offer, and beyond that the marvelous blessings of the restored gospel of Jesus Christ. How lucky can you be. Walk with appreciation and respect for the blessings of life and happiness which you enjoy." 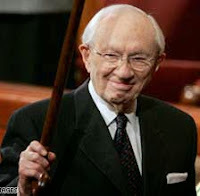 This was a frequent theme for President Hinckley. 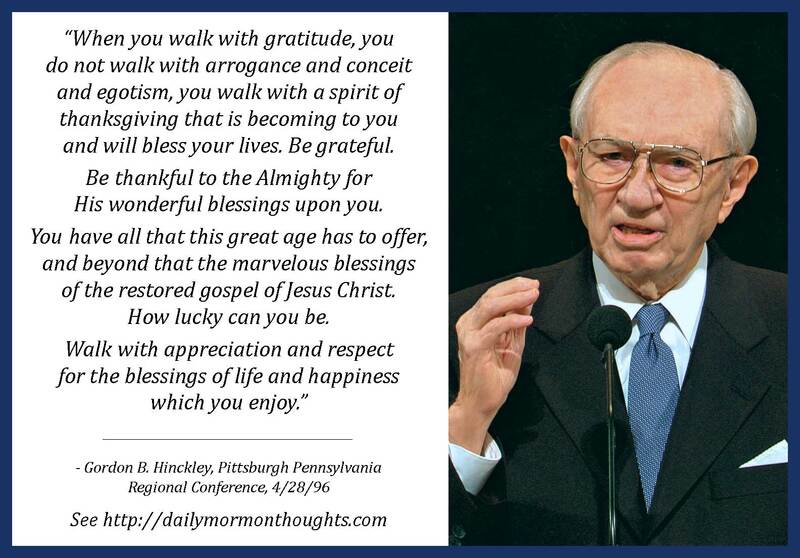 He reminded us regularly that there are blessings that come to a grateful heart. It's interesting to ponder what true worship is. Standing in awe and admiration of a divine Being far greater than ourselves seems only part of the action; but to express our deep and sincere appreciation to that Being, not just in words and thoughts, but in actions and emulation, seems to complete the expression. In this excerpt, President Hinckley describes what a life of gratitude looks like—the simple humility that will accompany a person who is truly grateful to God for the blessings that have come. To truly "walk with gratitude" is more than just occasionally remembering to feel or express it. It implies a constant, consistent, ongoing attitude that expresses itself in all we do. Labels: appreciation, blessings, gratitude, Hinckley Gordon B.